Smartwatch maker Pebble’s platform is now compatible with apps for Google’s Android Wear operating system, letting users see and respond to notifications from their wrists. The functionality was made generally available on Monday, after having been beta tested since December. Notifications is the basic building block of Android Wear, and what users can do and see on smartwatches running Google’s OS can now be replicated on Pebble’s products. Pebble has posted two videos showing how users can reply to a Google Hangout message and approve money transactions via Square Cash. 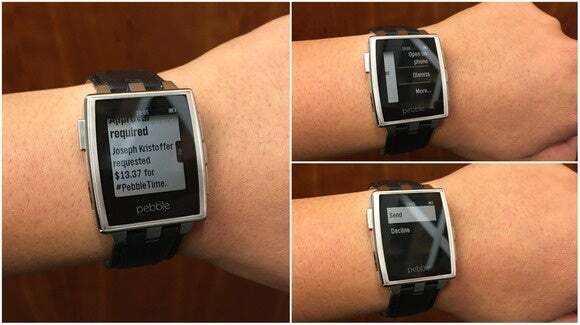 During the beta test, Pebble also added pre-defined replies to notifications, making it easier to reply direct from the smartwatch. To be able to use the Android Wear integration, Pebble owners have to update the firmware on their watch and download the latest version of the company’s smartphone app for Android. Pebble’s strategy in a market that’s becoming increasingly competitive is all about momentum: get a good running start and steadily pick up the pace, it said. So far, the company has managed to do that, with a steady stream of software updates, more apps in its app store and price cuts in the fall helping maintain strong sales in the second half of the year, according to market research company Canalys. Adding support for Android apps is a tactic that’s been tried with mixed results by the likes of BlackBerry on its smartphones. 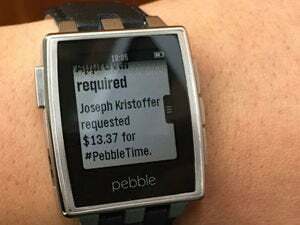 The advantage Pebble has is that smartwatch apps are far less advanced than smartphone apps, and therefore demand less of the underlying platform. The next 12 months will make or break the smartwatch market, with the arrival of the Apple Watch in April among the most-anticipated product launches. “The Apple Watch will be instrumental in taking the wearables market to the next level of growth. If successful, it’ll create a rising tide that will lift the whole market,” said Ben Wood, chief of research at CCS Insight. But the flip side of that is if sales of the Apple Watch fail to meet expectations, it could hurt the whole smartwatch market. What Pebble has in store for the year remains to be seen, but the company is working on new products and a new software platform to stay relevant.